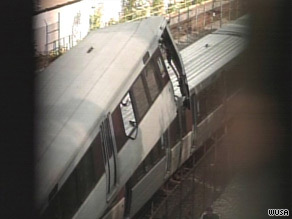 WASHINGTON (CNN) -- A rush-hour collision Monday between two Metro trains north of downtown Washington, D.C., killed at least six people and injured scores, Mayor Adrian Fenty said. One train was stationary when the crash happened, according to Metro General Manager John Catoe. He called it the deadliest crash in the history of the Washington Metropolitan Area Transit Authority, known as Metro. One of the dead was the female operator of one of the trains, Metro officials said. "The scene is as horrific as you can imagine," Fenty said in a news conference. "One car was almost squeezed completely together." The crash happened just before 5 p.m. on an above-ground track on the Red Line in the District of Columbia near the border with Takoma Park, Maryland. "Metro officials do not know the cause of the collision and are not likely to know the cause for several days as the investigation unfolds," a Metro statement said. President Obama issued a statement saying he and his wife Michelle were "saddened by the terrible accident," and thanking the first responders to the scene "who arrived immediately to save lives." A survivor, Jodie Wickett, described feeling a bump on the track, and then being flung forward when the train suddenly halted a few seconds later. She said she hit her head, but managed to get out and go to where the collision occurred a few cars up, where one subway car lay atop another. "There was debris, and people pinned under in-between the two cars," Wickett said. "We were just trying to get them out and help them as much as possible, pulling back the metal." People were badly injured, she said. "Ones that could speak were calling back as we called out to them." One car was "about 75 percent compressed," and recovery workers aren't sure if any more bodies are inside, Fenty told CNN's "Larry King Live" on Monday night. "We just haven't been able to cut through it to see if there's bodies in there," Fenty said. A certified nursing assistant who was on one of the trains told CNN affiliate WUSA she was trying to help those in severe condition after the crash, including a lady who appeared to be in her 20s. "She is very, very torn in her legs -- the muscles and everything are torn, ripped through. She had metal pieces in her face," said the nursing assistant, who said her name was Jeanie. Other witnesses described seeing more blood than they had seen before. Tom Baker, who was in the train that hit the stationary train, told WUSA that after the collision, he looked toward the front of the car, and when the smoke cleared, "all you could see was sky." Jasmine Gars, who also was on the moving train, told CNN's "Larry King Live" that the collision "was like nothing I've ever felt before." "It was like we hit a concrete wall," Gars said. "Almost immediately I fell off my seat. Another person -- I don't know who -- flew off their seat. And the lights went off and smoke started filling the train car." Four people were taken to Providence Hospital in Washington, including two with back injuries, one with a hip injury and one complaining of dizziness from hitting her head, hospital officials said. Washington Hospital Center reported seven patients from the crash with injuries ranging from serious to minor, while Howard University Hospital reported three and Suburban Hospital in Maryland reported two. Groups of people wearing green plastic ribbons to show they had been checked by paramedics left the scene about 90 minutes after the crash. Some were crying, and a woman with her arm in a sling who gave her name as Tijuana described the crash as "an earthquake." A National Transportation Safety Board team arrived to investigate the crash, assisted by the FBI Evidence Response Team, according to NTSB board member Deborah Hersman, who said she walked the tracks by the wreckage. "I can tell you it is a scene of real devastation down there," she said. Hersman said both trains contained six cars. One train struck the other train from the rear and and its "first car overrode the last car of the other train in an accordion fashion," she said. She said it wasn't clear if the trains involved in the accident carried devices that recorded speed and other data. At least two FBI officials were at the scene, and the FBI confirmed it was assisting as part of the National Capital Response Squad. Amy Kudwa of the Department of Homeland Security said "at this early stage," there was no indication of anything other than an accidental collision. It was the second Metro crash to involve fatalities in the 33-year history of the transit authority. In January 1982, a derailment killed three people. The only other collision between Metro trains occurred in 2004. "We are extremely saddened that there are fatalities as a result of this accident, which has touched our Metro family," Catoe said in a statement. "Our safety officials are investigating, and will continue to investigate until we determine why this happened and what must be done to ensure it never happens again."